The Karrimor Spike Low Walking Shoes are an archetypal walking and approach shoe. They have a suede, mesh and webbing upper with a waterproof “weathertite” lining (Note: “weathertite” is a Karrimor specified waterproof and breathable fabric). The sole unit has an EVA midsole with a defined medium tread depth outsole. The tread on the outsole is typical of a shoe designed to be used on rocky and relatively muddy terrain. This represents a reasonable compromise between an open large tread (intended for very muddy underfoot conditions) and the very low to slick tread we see on more climbing orientated approach shoes. In terms of grip from the sole; they excel in the environment they are intended for i.e. slightly muddy and rocky paths. However, the rubber compound used does begin to struggle on wet and lichen covered rock. There have been reports of the tread pattern wearing down prematurely; however this is most likely due to being used on pavements (outdoor shoes rather paradoxically aren’t suited to use on pavements and quite often, from experience, wear down very quickly). There is a welcome addition of the waterproof “weathertite” lining on the Karrimor Spike Low Walking Shoes. In approximately 30 days of testing this has prevented water ingress to the inside of the shoes (Even whilst using them for a ghyll scrambling session through fast flowing water didn’t result in any leaking) and also surprisingly they haven’t at any point felt too sweaty or non-breathable (Ultimately they’re not going to breathe as well as mesh or ventilated trainers but they certainly didn’t disappoint in temperatures of 20°C+ at times). In terms of fit; everyone’s individual feet differ so it is crucial to remember that you need to find if they fit your feet specifically. From use, it is important to keep in mind that as a walking shoe they will be slightly stiffer than a typical trainer or fell running shoe. This subsequently has an impact in terms of the overall fit, and led to me needing to use the additional lace eyelets to secure the ankle cuff of the shoe. The suede, mesh and webbing uppers feel comfortable in use and flex well with the foot. There is also a substantial rand running around the outside of the shoe for better durability. However, across the toes (where the rand joins the uppers) there is a seam which has suffered from some abrasion (see picture: this is typical of a seam in a high wear location). Outsole works well on relatively muddy paths. Uppers are comfortable in use. Lacing system works effectively to secure foot. Waterproof lining is a very welcome addition without greatly impeding breathability and overall comfort. Waterproof “weathertite” lining is presumably a PU coating, therefore may not have the longevity/durability and manufacturing reliability of a membrane fabric (e.g. Gore-tex). 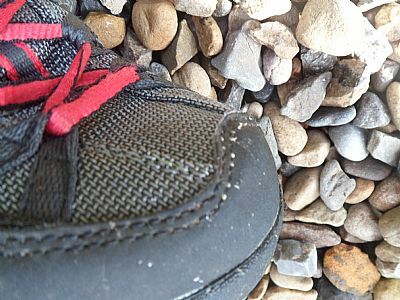 Outsole has limited grip on wet rock. Seam across toes is likely to wear due to scuffing. The Karrimor Spike Low Walking Shoes are a very functional waterproof walking and approach shoe ideal for low level country walking on defined paths. 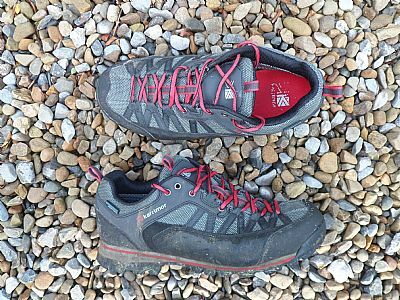 The Karrimor Spike Low Walking Shoes on review here have been provided by Outdoor Look.